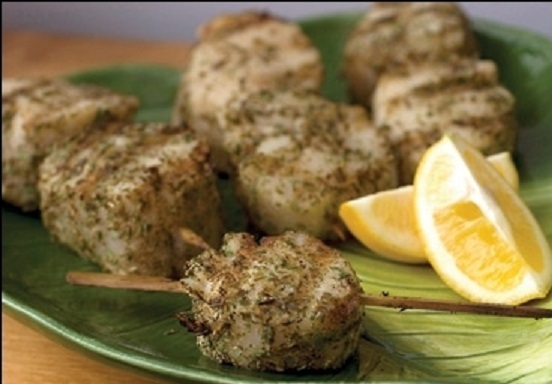 There are three kinds of scallops that are consumed in the United States—sea scallops, bay scallops and calico scallops. Sea scallops are relatively large, often 1½”-2” in diameter, and are often presented in beautifully seared platings of two or three. Bay scallops are much smaller, although some aficionados find them to be sweeter than sea scallops. Because of their small size, bay scallops are not the ideal scallop for searing but are excellent in stir-fries and even cooked as scampi to be served as a light pasta sauce. Calico scallops are harvested off of the US Gulf and Southern Atlantic coasts. Unlike sea and bay scallops, their shells are tightly closed, and they must be steamed open before further preparation. Although similar in shape, size and color to bay scallops, they are less sweet and less tender than their Northern cousins. Speaking of shape, size and color, the adductor muscle itself can range in color from pale ivory to beige. Raw scallops are somewhat translucent and are generally round. Large sea scallops might be up to an inch thick and up to 2” in diameter, while bay and calico scallops, while shaped the same, are much smaller. Scallops are harvested in one of two ways—by trawling or by diving. Trawling is done by scraping the ocean floor and pulling up scallops (and whatever else is down there) without regard to maturity or to the damage possibly being done to the ocean floor. A more environmentally friendly, albeit expensive, method of harvest is by diver and the scallops are known as “diver scallops.” A diver scallop is not another species of scallop, nor does it designate size. Rather it describes the manner in which the scallops were harvested. Divers go down and choose mature scallops by hand, leaving behind immature scallops as well as leaving the ocean floor alone. Since the ocean floor is not disturbed by the divers, diver scallops are usually less gritty than those harvested by bottom trawls. Like shrimp, scallops are sold by count-per-pound. Sea scallops might be marked at 10/20, meaning that between 10 and 20 scallops are in each pound. Of course, larger sea scallops tend to be the most expensive. Another weight designation you might see is U/10 or U/15. This means that it takes fewer than, or under, 10 (or 15) to make up a pound. Here again, the larger the U number, the smaller the scallop. Bay scallops, being smaller than sea scallops, generally fall in the 70/120 range. When purchasing scallops, make sure to buy from a reputable fishmonger and be sure to smell the scallops before purchase. The scallops should smell clean and sweet and like the ocean. If they have a strong fishy smell, do not buy them. The muscles should be in one piece, so inspect them carefully. If you see signs of the muscle fibers pulling apart, pass them by as this is a sign that the scallops are past their prime. As mentioned before, dry pack scallops should feel slightly sticky but not be slimy. If the rubbery side muscle has been left on the scallops, remove them. Fresh scallops need to be stored at temperatures below 38F. This is generally lower than most people keep their refrigerators, so you will have to make some adjustments. An ideal set up for storing scallops is to have a shallow plastic container with holes in the bottom that is set in a deeper plastic container. Place ice in the shallow container and spread the scallops on the ice. Cover everything with a damp paper towel, and store in the coldest part of the refrigerator. Even with this care, make sure to use the scallops within a day or two. Because they are so perishable, using them the same day you purchase them is ideal. Scallops are a very lean protein, and as such, they can toughen very easily during cooking. It is very important not to overcook scallops as they can go from succulent to rubber pretty quickly. Don’t take your eyes off them when cooking and make sure that you remove them from the heat while they are still moist and plump. Sautéing, broiling and grilling are all simple, dry heat methods by which you can cook large sea scallops to really showcase them. Moist heat methods, including stir-fry with a sauce and simmering (as in soups, stews and risottos), are perfect for the small, sweet bay scallops. Season the scallops with salt and pepper. Heat the 1 teaspoon olive oil in a small skillet and saute scallops for 2 to 3 minutes or until the scallops have a nice sear on each side. Add garlic to the pan and cook an additional 30 seconds. 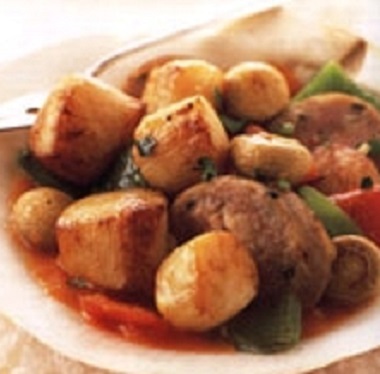 Remove the scallops and garlic from the pan, and place in a large, heat-resistant bowl. Toss tomato halves and cucumber with the warm scallops. 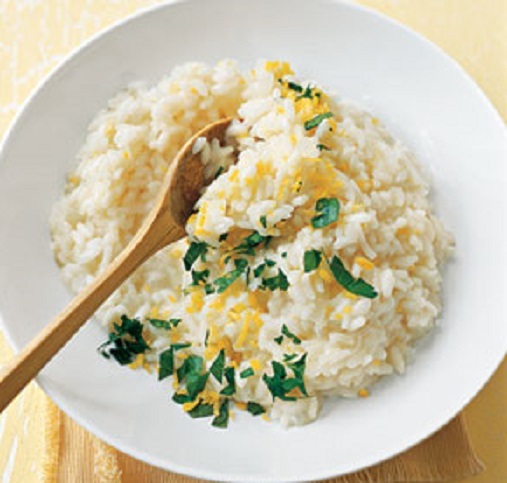 In a small bowl combine the extra-virgin olive oil, white wine vinegar, lemon juice, and the shallots. Whisk until well blended. Pour dressing over warm scallop mixture, tossing to coat. Adjust seasonings with salt and freshly ground black pepper. Sprinkle chopped oregano and parsley over the salad, and toss to coat. Arrange two lettuce leaves on each salad plate. Divide the scallop salad among the 4 plates, on top of the lettuce. Combine the coating ingredients on a plate & mix with your fingers. Wash scallops & remove the small, tough side muscle. Pat the scallops dry with paper towels & place this in a small bowl. Add the olive oil & mix to coat. Dip the scallops in the coating, turning to cover evenly. Cover loosely with plastic wrap and refrigerate for 30 minutes to set the crumbs. Finely chop the parsley and lemon zest and mix together. Grease a grill tray that fits over the grill grates generously with oil. Place the scallops on the grill tray 1-2 inches apart and grill over direct medium heat until just opaque in the center, about 8 minutes, turning once halfway through grilling time. Treat them carefully when turning. Remove from the grill, place a little of the garnish onto each scallop and serve warm. 1. Fill a pot to cook the pasta with about 6 quarts of water, place over high heat, and bring to a boil. 2. Peel the tomatoes and coarsely chop them. Peel the garlic clove and finely chop it. 3. Put the garlic, hot red pepper flakes, and the olive oil in a 12-inch skillet and place over medium-high heat. As soon as the garlic begins to sizzle, add the tomatoes. Season with salt and cook until the liquid the tomatoes release has evaporated, 10 to 12 minutes. 4. While the tomatoes are cooking, cut the scallops into ¼-inch dice. 5. When the tomatoes are ready, add about 2 tablespoons salt to the boiling pasta water, add the spaghetti, and stir until all the strands are submerged. Cook until al dente. 6. Shred the basil leaves and add them to the pan with the tomatoes. Raise the heat to high and add the scallops. Cook until the scallops are done, 1 to 2 minutes, then remove from the heat. 7. When the pasta is done, drain well, toss with the sauce, and serve. Pour 1 teaspoon oil into a small saute pan, heat and spread oil, add the sausages, and cook until they are lightly browned and cooked through. Drain the sausages on paper towels. Set aside and keep warm. Slice each sausage on the bias into 1/2-inch slices. To the pan add 1 teaspoon oil and add the peppers and mushrooms. Saute quickly for several minutes. Add 1/2 tablespoon of garlic and saute for 1 more minute. Remove from the pan and add to sausage. In the same pan, add the remaining 1 teaspoon oil and heat on high. Saute the scallops for several minutes until just lightly browned. Do not overcook. Add the remaining garlic and the sausage, peppers and mushrooms, and continue cooking for a few more minutes. Add the lemon juice, remove from heat, and add the butter and parsley. Serve with crusty bread. In a small bowl combine the tarragon, thyme, oregano, garlic powder, pepper and oil. Add the scallops and toss to coat. Cover the bowl and refrigerate 2 to 10 hours. Oil a ridged stove-top griddle or outdoor grill and preheat it. Season the scallops lightly with salt and thread 3 on each skewer, and grill about 1 1/2 minutes per side, or until slightly firm. Remove and set aside. Sweat the leek in 2 teaspoons of butter over low heat in a tightly covered straight-sided saute pan for 6 minutes, stirring once or twice. Add the rice and raise the heat to medium, stirring often for 3 minutes. Add 1 cup of stock, season lightly with salt and pepper, and stir until all of the liquid has been absorbed. Add the remaining broth, 1/2 cup at a time, stirring constantly after each addition. When all of the liquid is absorbed, add the zest and continue to cook for about 10 minutes more, until the rice is al dente. Stir in the lemon juice. Season well with salt and pepper, add the chives or parsley, stir in the remaining 2 teaspoons of butter until it melts and serve hot. Serve with cooked spinach or asparagus.